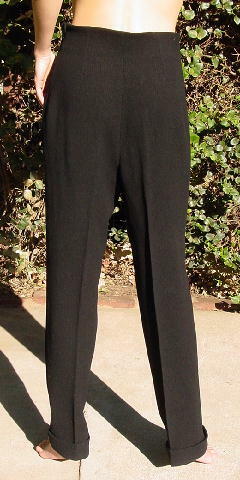 These vintage black pants are 100% wool and have a ribbed texture. There are vertical pockets (still sewn shut). 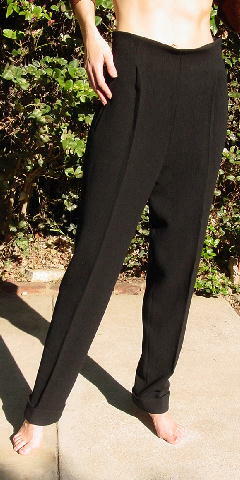 There is a pleat on each front side which goes downward and becomes the center crease on each pant leg. They have 1 7/8" cuffs. 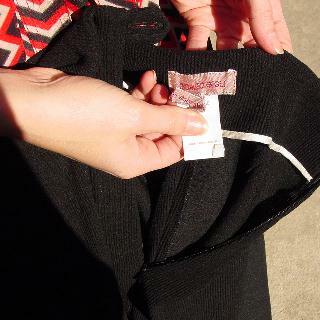 There is a 9" left side zipper. They were from a larger size New York model. She wore them with a Ferretti Studio brown sweater. waist to hem 43 3/4"